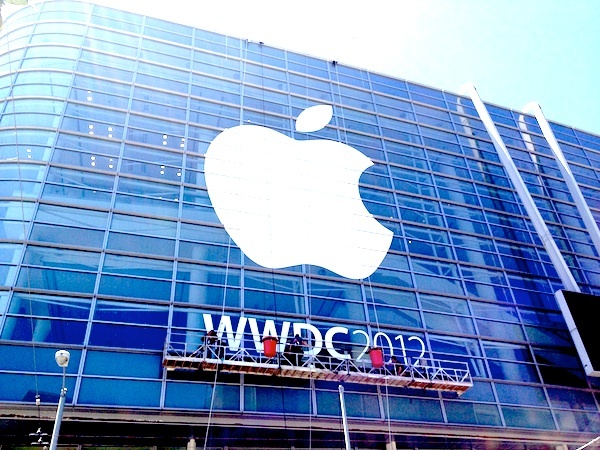 The Apple digital banner at Moscone Center (photo above) showcased the new iOS logo with the caption: “The world’s most advanced mobile operating system.” The creative revision for iOS 6 Logo is the use of water ripples vs. the droplets from iOS 5 in 2012. 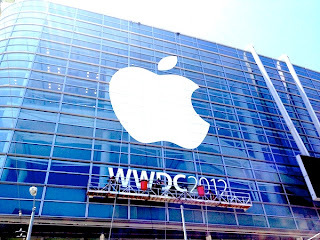 The next four days will be a whirlwind of innovative, integrative, technologies at The Apple Worldwide Developers Conference (WWDC)2012 at downtown San Francisco's Moscone Center. Tickets to the event were $1,599 and sold out in 1 hour and forty-three minutes. Shortly after that, scalpers were outside selling tickets to many willing to pay thousands more during this grand opening. Live streams of the event will be available on Apple's website. The minimum age requirement dropped to 13 years young from 18 years illustrating the trend in more 13 year old Apple software developers. Of course eligible members between 13 and 17 years of age must have their parent or guardian purchase tickets. 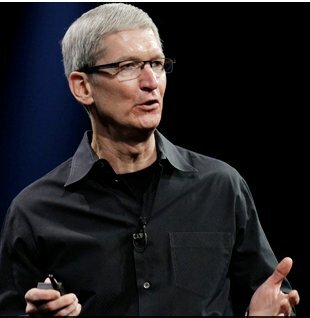 Apple CEO Tim Cook began with compelling statistics of software on Apple's gadgets. “The App Store has some 650,000 apps, over 30 billion downloads to date, and payments to Apple developers a total of more than $5 billion,” Cook said. The theme this year was not about new product hype but more about mobility, interoperability and the impact this will have from a usage perspective on people’s lives. "Designed by Apple from the ground up, Maps gives you turn-by-turn spoken directions, interactive 3D views, and the stunning Flyover feature.1 All of which may just make this app the most beautiful, powerful mapping service ever." 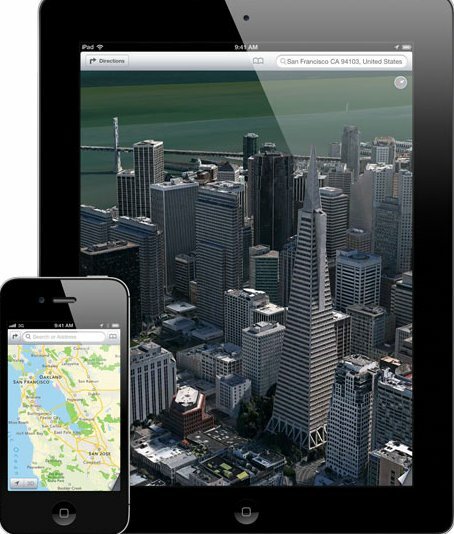 The main iOS 6 improvements are Apple's own mapping application, switching from Google Maps, that will have a 3D map app, deep integration with Facebook, and enhanced photo-sharing features. Last year’s WWDC keynote, Apple revealed more about OS X 10.7 Lion, and debuted iOS 5 and iCloud. This year, the event unveiled latest mobile iOS 6, OS X 10.8 Mountain Lion and the new line of laptops. 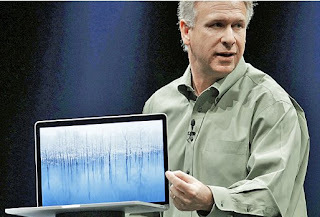 Next up was Phil Schiller, senior vice president of worldwide marketing who unveiled the new MacBook Pro, describing it as “The most beautiful computer we’ve ever made.” Known as the New MacBook Air, it weighs less than 4.5 lbs, is less than .71” thick, and has high definition retina display, so sharp that you don't see the pixels. The "beautiful" laptop will retail in July starting at $2199 and will be a new industry standard for screen sharpness with higher screen quality, a 15-inch screen, 4X resolution of previous models, better video quality, and a much longer battery life. Developers are already able to download a version of OS X 10.8 Mountain Lion, which narrows the gap between the PC and phone software packages, making Mac personal computers work more like iPhones. SIRI will not be just for your car but also speak to your iPad and iPhone. There are also added virtual assistant features to SIRI which interprets voice commands and talks back to the user and is integrated with other apps – for example, you can have voice commands integrated with Yelp and Apple Maps. Also, according to Apple, the new version of its Mac operating system, OS X 10.8 Mountain Lion, will go on sale next month for $20. The update brings features from Apple's phone and tablet software, like the iMessage texting application, to the Mac. There is a broader integration with social media, not just Facebok and Twitter but sharing info from devices, friends devices, etc. So what was not mentioned at this year’s event? The Apple TV and specifically what new features will come with iOS 6, or when it will be released to consumers. ► Apple expected to show fresh software. "The minimum age requirement dropped to 13 years young from 18 years illustrating the trend in more 13 year old Apple software developers. Of course eligible members between 13 and 17 years of age must have their parent or guardian purchase tickets." Wow! Some teens are quite gifted and ambitious. It's great that they're being allowed to participate in that experience. Tim looks like he’s trying to mimic Steve’s appearance. I’m not a fan of this.